Indian car consumers jumped in joy when they heard the news of a car getting make-over into a style and looks. It is obviously not a normal reaction but it certainly is, when the car is already a champion and winning millions of hearts. It’s the car none other than Ford Fiesta. Fiesta has gone under the scalpel numerous times since its launch in India in 2005. But this time it’s different and special as this version has come a long way after proving its worth in almost half of the world. The blue oval insignia of the American auto major Ford India can now give a head on competition to the already victorious cars like Honda City, Volkswagen Vento and Hyundai Verna. The most important part is the car is not afraid of the giants and is standing tall upfront to prove its worth in the market. Within the big lineup of variants Ford Fiesta 1.5P Ambiente comes first. It has a TiVCT Petrol engine which churns out a maximum power of 107.5bhp @ 6045rpm and a whopping torque of 140Nm @4500rpm. When talking about the exterior design of this car, it stands out because of its adherence of Kinetic design philosophy. Ford endows the exteriors of this car with twin chamber bright reflector Foxy Eyes shaped headlamps, body coloured rear appliqué, body coloured bumpers, black coloured door handles and outside mirrors, turn indicators on ORVM, full wheel covers and tinted glasses.These astonishing features will definitely make one’s eyes to momentarily settle on the all new endearing Ford Fiesta. The overall dimensions of this car stand out to be 4291mm, 1722mm, 1496mm in length, width and height respectively. Under the bonnet the most staggering hard work of Ford could be seen. Ford Fiesta can give a head on competition to the rival cars with its 1.5 litre TiVCT petrol engine which outputs a power of 107.5bhp @ 6045rpm and a exhilarating 140Nm of torque at 4500rpm. It is tuned to displace a The combination of 4 cylinder in-line 16V DOHC engine with the Ti-VCT fuel system gifts the benefits like lesser fuel emissions and betters fuel consumptions. Even after being a sedan, a turning radius of just 5.2 meters can be marked all because of its unique design of the chassis. For enhanced safety front brakes are provided with ventilated disc brakes while at the rear self adjusting drum brakes are installed. 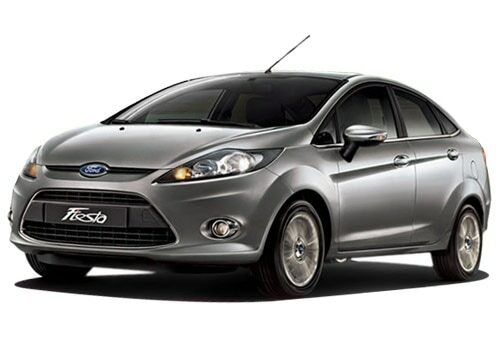 Safety has been given upmost priority in the all new Ford Fiesta with features like ABS with ABD. It also comes with a driver side airbag for enhanced safety. This car is also packed with other safety features like door reinforcements, child lock, remote entry key and engine immobilizer. Engine immobilizer is a smart features accommodated in this car which will freeze the car in the case of any forceful entry. Comfort feature category has taken a whole new level of competition because that is the first thing which a buyer looks in the car. Every new car launching now a days has something different and unique to see. This terrific car comes equipped with various features which will let the comfort be felt by itself. Few of the other features are tilt adjust steering which is turns out to be of a great help when it comes to drivers of different heights. Front and rear power windows are a norm these days but they are as important as salt in any dish. Rear defogger is also one of the must-to-have-feature in a car. ‘Guide me home’ headlamps do not do what they literally say rather it’s a feature where headlamps stay on for 60 seconds even after the car being locked just to show one’s home in the dark . Height adjustable seat belts, height adjustable driver seat, rear center armrest, electric boot release and electric outside rear view mirrors are another important feature to make the drive comfortable and easier. Gadgets in this car are also not far behind if compared to other tech featured installed. The all new Ford Fiesta comes pre fitted with gadgets like tachometer, low fuel warning system, driver seat belt warning and headlamp on warning system. Hefty price tag could come out as a very big con.